Tyrannosaurus Rex had the most strongest bite force of any *land* creature. Its bite would almost always be fatal. It could even bite through rock or solid metal! 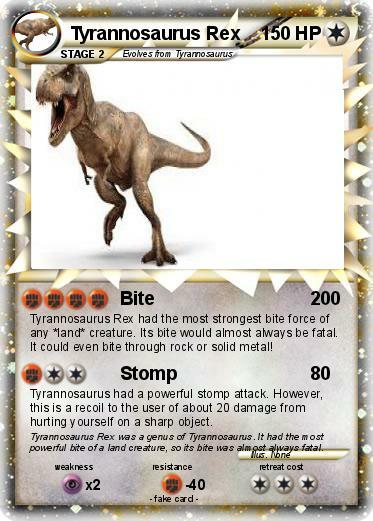 Tyrannosaurus had a powerful stomp attack. However, this is a recoil to the user of about 20 damage from hurting yourself on a sharp object. Comments : Tyrannosaurus Rex was a genus of Tyrannosaurus. It had the most powerful bite of a land creature, so its bite was almost always fatal.